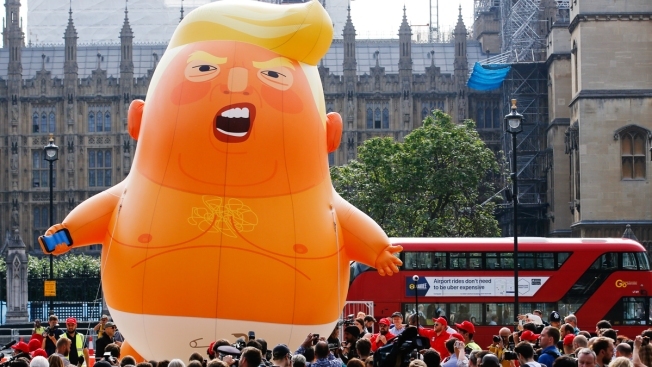 The 20-foot-tall inflatable orange baby with the face of Donald Trump that flew over Britain’s parliament for the president’s U.K. visit may be floating its way across the pond to the U.S.
A GoFundMe campaign to bring the giant blimp of ‘Baby Trump’ — from the recent protests in the U.K. — to the United States has raised more than $10,000 in just three days, doubling its original goal, NBC News reported. The "Fund To Bring Baby Trump to America" was a joint collaboration between activists Jim Girvan and Didier Jiménez-Castro. Girvan and Jimenez plan to do a nationwide tour with the blimp starting in August and are hoping to use the money they raised to create an American-made version. President Trump Protest organizers said they planned to stage anti-Trump demonstrations in some 50 cities around the U.K.